Whether it’s talking on the phone or typing on the computer, small children will try to imitate their parents. My one-year-old is certainly no exception. He’s taken to trying to pound on any computer keyboard I’m currently using. I’ve tried giving him a spare keyboard and even a defunct computer, but only a working model will do. So for those times when I just want to let him loose for a few minutes, I’ve found a couple of programs that he can operate by himself without endangering the health of the computer. AlphaBaby (free, Mac) Load this program and with every keystroke a new letter or shape will appear on the screen. Choose from silent, sounds or the spoken name of each item. 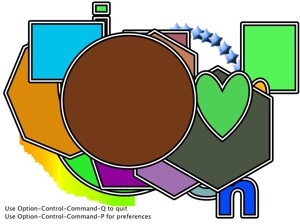 The only way to exit the program is to hit and hold a combination of four keys (option/control/command/Q). The exit code is displayed each time the program runs, so you don’t have to memorize it. An iPhone version is also available ($0.99). Giggles Computer Funtime for Baby: My Animal Friends ($20, PC and Mac) Tapping keys or clicking the mouse will make fish blow bubbles, groundhogs pop out of their holes or penguins slide down ice slides. There are four other titles in the series: Shapes, ABC’s & 123’s, My Musical World and Nursery Rhymes. You can download the full version for a free 5-minute trial, which feels longer than it sounds. This is absolutely great to find out. My wife and I are expecting in a couple of months and we have a list of “baby protection items” that we are addressing. We wanted to get a head start so we don’t feel overwhelmed when it’s really time to do these things. My plan was to keep expensive electronics away from our baby, but that’s just not going to happen. Thanks for the terrific information! My plan was to keep expensive electronics away from our baby, but that’s just not going to happen. Thanks for the terrific information!